Capillaries are small blood vessels located near the surface of the skin and are responsible for the microcirculation of the body. 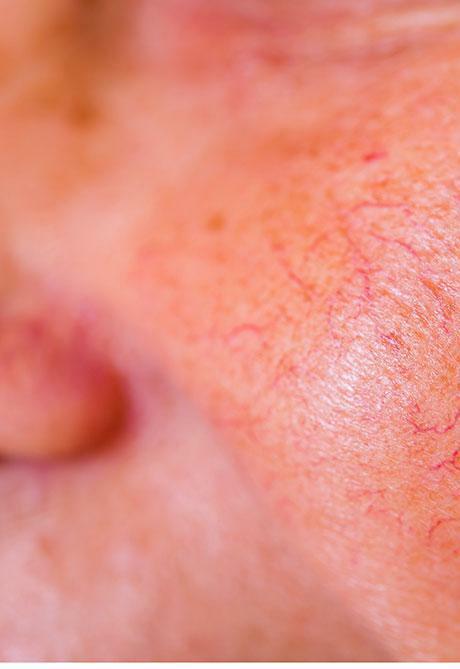 Anytime the blood vessel walls contract and expand quickly, there is a chance of breakage, resulting in the appearance of telangiectasia, also known as “broken capillaries”, or “spider veins.” Spider veins look like a spot underneath the skin consisting of red or blue squiggly lines or splotches. Factors that can cause broken capillaries include malnutrition, disease, traumatized immune systems, excessive heat exposure, or friction of the skin. People with fairer skin are more susceptible to having broken capillaries, as well as skin that is dry, dehydrated, sensitive, or thinner in nature due to the natural aging process.